Phagocytosis is a specialized mechanism used by mammalian cells, particularly the cells of the immune system, such as dendritic cells (DC) and macrophages, to protect the host against infection. The process involves a complex cascade of pathways, from the ligation of surface receptors of phagocytes with components of the microorganism’s surface, formation of phagosomes and subsequently phagolysosomes, to the eventual presentation of foreign Ags. Vesicle-associated membrane protein (VAMP)-8/endobrevin has been shown previously to function in the endocytic pathways. Our results showed that VAMP-8 colocalized with lysosome-associated membrane protein-2, and a significant amount of VAMP-8 was recruited to the phagosomes during bacterial ingestion. However, overexpression of VAMP-8 significantly inhibited phagocytosis in DC. We also found that the phagocytic activity of VAMP-8−/− DC was significantly higher than wild-type VAMP-8+/+ DC, thus further confirming that VAMP-8 negatively regulates phagocytosis in immature DC. Phagocytosis is a specialized mechanism used by mammalian cells, particularly the cells of the immune system, such as dendritic cells (DC)3 and macrophages, to protect the host against infection. The process involves a complex cascade of pathways, from the ligation of surface receptors of phagocytes with components of the microorganisms’ surface, formation of phagosomes and subsequently phagolysosomes, to the eventual presentation of foreign Ags. Recognition of particles to be phagocytosed is promoted by various cell surface receptors, from opsonin-dependent receptor such as Fc receptors and complement receptors (CR1 and CR3), to opsonin-independent receptors such as mannose receptor and scavenger receptors. Receptor-particle interaction is accompanied by intracellular signals that trigger cellular processes such as actin polymerization, which is required for extension of the plasma membrane to form pseudopods for the engulfment of particles. This extension is mediated by Cdc42 (1), a small GTPase belonging to the Rho family. To facilitate membrane extension and to compensate for the reduction in plasma membrane surface area, exocytosis of vesicles at the phagocytosis site must take place concurrently (2). Following invagination and budding of cell surface membrane, phagosomes are formed that undergo maturation through a series of fusion steps with various endocytic compartments, eventually forming phagolysosomes. Until now, the nature and origin of the membranes contributing to phagocytosis is still not known. However, earlier studies have shown that transferrin receptor or cellubrevin/vesicle-associated membrane protein (VAMP)-3 containing recycling vesicles exocytose at the site of phagocytosis (3). In addition, VAMP-3 has been indicated to play important roles in phagocytosis based on the findings that tetanus neurotoxin, which cleaves and inactivates VAMP-2 and VAMP-3, inhibits phagocytosis in macrophages (4). Based on the SNARE (soluble N-ethylmaleimide-sensitive factor (NSF) attachment protein receptor) model, it was predicted that VAMP-3 (an R-SNARE) could function as a vesicle-associated SNARE (v-SNARE) essential for recycling endosome-plasma membrane fusion. However, studies performed in VAMP-3 gene knockout mice indicated that VAMP-3 was not required for phagocytosis of opsonized particles and latex beads (5, 6). A more recent study by Braun et al. (7) showed that VAMP-7-anchored compartments of the late endocytic pathways also undergo exocytosis at the site of phagocytosis in macrophages. In the study, VAMP-7 was shown to be essential for optimal phagocytosis of opsonized particles and thus positively regulates phagocytosis in macrophages (7). Other studies suggested the existence of endoplasmic reticulum (ER)-mediated phagocytosis (8, 9, 10), whereby the ER membrane was targeted to the phagocytic site to aid in phagosome formation. However, by using a combination of biochemical, fluorescence imaging and electron microscopy techniques, Grinstein and colleagues (11) did not obtain evidence to prove the direct fusion between the ER and the plasma membrane. ER-mediated phagocytosis remains a subject of controversy. VAMP-8 was identified as a member of the endosomal synaptobrevin/VAMP family (12, 13, 14). It has been shown to preferentially associate with early endosomes (13, 14). It was later found to be present on all membranes known to communicate with early endosomes, such as the plasma membrane, trans-Golgi network, clathrin-coated pits and late endosomes (15). VAMP-8 is an R-SNARE that maps to chromosome 2 in human and chromosome 6 in mouse (16) and exhibits 32%, 33%, and 31% amino acid sequence identity to VAMP-1, VAMP-2, and VAMP-3, respectively (13). A comparison of mouse VAMP-8 with human VAMP-8 revealed that the motifs are very well conserved. VAMP-8 forms a complex with Syn-7, Syn-8 and Vti1b, which mediates homotypic fusion of early and late endosomes (15, 17, 18). This same set of Q-SNAREs also partners with VAMP-7 for mediating fusion of late endosomes and lysosomes (18). In this study, we show that VAMP-8 negatively regulates phagocytosis of bacteria in DC. This report is the first on a SNARE protein that functionally inhibits phagocytosis in phagocytic cells. The Abs used were purchased commercially from the following manufacturers: VAMP-3 (Synaptic Systems), VAMP-8 (Synaptic Systems), Syn-16 (Synaptic Systems), lysosome-associated membrane protein (LAMP)-2 (BD Biosciences), monoclonal anti-c-myc (Calbiochem), polyclonal anti-c-myc (Santa Cruz Biotechnology), CD204 (Serotec), CD36 (BD Biosciences), epidermal growth factor receptor (Upstate Biotechnology), and β-actin (Sigma-Aldrich). Fluorescent-conjugated secondary Abs were from Jackson ImmunoResearch Laboratories. The restriction endonucleases EcoRI and XbaI, T4 DNA ligase and Pfu polymerase were purchased from Promega. VAMP-8 knockout mice were generated as previously described (19). Extraction of plasmid was based on the QIAprep Spin Miniprep kit. Plasmids extracted from Escherichia coli containing mouse VAMP-8-ligated pCMV-SPORT6 vector (Mammalian Gene Collection (MGC) ID: 13842, Integrated Molecular Analysis of Genomes and their Expression (IMAGE) ID: 4205509), human VAMP-3-ligated pDNR-LIB vector (MGC:12463, IMAGE:3681914), and human VAMP-7-ligated pCMV-SPORT6 vector (MGC:64832, IMAGE:6503665) were subjected to PCR using Pfu polymerase. Forward primers were designed with an EcoRI restriction sequence and reverse primer with XbaI sequence. The following VAMP primers were used: VAMP-8, (forward) 5′-GGAATTCCATGGAGGAGGCCAG-3′ and (reverse) 5′-GCTCTAGAGCTTAATGGGGATG-3′; VAMP-3, (forward) 5′-GGAATTCCATGTCTACAGGTCCAACTGC-3′ and (reverse) 5′-GCTCTAGAGCTCATGAAGAGACAACCCACA-3′; and VAMP-7, (forward) 5′-GGAATTCCATGGCGATTCTTTTTGCT-3′ and (reverse) 5′-GCTCTAGAGCTCATGAAGAGACAACCCACA-3′. The desired DNA band was excised and purified using QIAquick Gel Extraction, and subjected to EcoRI and XbaI digestion. The VAMP-3/VAMP-7/VAMP-8 insert was ligated to EcoRI- and XbaI-digested pDMyc plasmid with a double Myc tag at the 5′ terminal. Transformation was performed and the clones were selected using 200 μg/ml ampicillin. Sequences were confirmed via sequencing. Primary mouse bone marrow-derived DC were prepared according to the method reported previously (20, 21). Briefly, cells were flushed from the long bones and cultured in complete DMEM with 10% FBS containing 20 ng/ml GM-CSF (day 0). Cells were fed with fresh complete DMEM containing 20, 15, and 10 ng/ml GM-CSF on day 2, 4, and 6, respectively. The cells were used on either day 5, 6, or 7. The phagocytosis assay is based on the Vybrant Phagocytosis Assay kit, with three modifications made to the protocol. First, 100 μl of K12 fluorescence E. coli bioparticles was mixed with 100 μl of medium to provide the cells with better conditions for engulfment. Second, the phagocytosis incubation time was reduced from 3 to 2 h to avoid the phagocytic activities of cells to be compared from reaching a plateau phase. Third, quenching time was doubled from 1 to 2 min to ensure extracellular particles were sufficiently quenched. Cells seeded into a 96-well ELISA plate at a concentration of 1–2 × 105 cells/well were allowed to adhere for 4 h to the bottom of the well, after which the fluorescence-conjugated E. coli bioparticles were added and phagocytosis was allowed to proceed for 2 h. The bioparticles were removed and the wells were added with trypan blue for 2 min to quench extracellular bioparticles. The trypan blue was then removed and the amount of bioparticles engulfed by the cells was quantitatively measured using either SpectraMax Gemini EM ELISA plate reader at 480 nm excitation and 520 nm emission or Tecan GENios ELISA plate reader at 485 nm excitation and 535 nm emission. DC2.4 cells were allowed to internalize GFP-E. coli (0.75 × 109 particles/ml) for 1 h. The cells were then washed three times with ice-cold PBS to remove extracellular bacteria and trypsinized for 10 min at room temperature. Cells were centrifuged at 100 × g (720 rpm on Beckman Coulter Allegra X-22R Centrifuge) for 5 min at 4°C to further remove extracellular bacteria. The supernatant containing the noningested bacteria were decanted, and the DC pellet was resuspended in 3 volumes of H buffer (8.6% sucrose, 25 mM HEPES, 5 mM MgCl2, 1 mM PMSF), then homogenized with Dounce Homogenizer. Cells were observed under microscope to ensure lysis. The homogenate was centrifuged at 100 × g (1000 rpm on Eppendorf Centrifuge 5415 R) to bring down any intact cells and heavier debris. The supernatant containing phagosomes and lighter membranes were carefully layered on 62% sucrose, and centrifuged at 13,000 rpm for 45 min using Beckman Coulter Optima MAX ultracentrifuge (MLS-50 rotor). The lighter membranes remained on top of the 62% sucrose, while the heavier phagosomes were pelleted to the bottom. The phagosomal pellet was washed twice with ice-cold PBS and then processed for Western blot analysis or immunofluorescent staining. Transfection was performed either with Qiagen Effectene Reagent kit or Invitrogen Life Sciences Lipofectamine 2000, according to the manufacturer’s protocol. At 24–48 h after transfection, the cells were observed for transfection efficiency, after which it was diluted to an appropriate concentration. Geneticin (Invitrogen Life Technologies), otherwise known as G-418, was added at 2000 μg/ml to select for cells stably expressing VAMP-8. Transfection was performed using Invitrogen Life Technologies Lipofectamine 2000. Small interfering RNA (siRNA) directed toward human VAMP-8 (catalog no. LQ-062971-01), as well as nontargeting siRNA pool (catalog no. D-001810-10), were purchased from Dharmacon. The amount of siRNA used for transfection was optimized at 2000 pmol per 10-cm dish transfection. The cells were assayed for their phagocytic activity at 48 h posttransfection. Proteins resolved by SDS-PAGE were electroblotted to a nitrocellulose membrane (Hybond) and incubated overnight at 4°C with blocking buffer (PBS containing 5% skim milk and 0.05% Tween 20). Primary and secondary Abs incubations were done in blocking buffer. The membrane was washed with PBS containing 0.05% Tween 20 and then analyzed using the Supersignal Chemiluminescent kit (Pierce) according to the manufacturer’s recommendation. Cells grown on coverslips were washed once with PBS, then fixed with 4% paraformaldehyde for 30 min on ice, after which they were washed thrice with PBS, followed by twice with 0.1% saponin in PBS. The cells were then incubated for 20 min in 0.1% saponin at room temperature to permeabilize them, after which primary Ab was then added and incubated for 1 h, followed by three washing steps with 0.1% saponin. Secondary Ab was then added and the coverslips were incubated in the dark for 1 h, washed four times with 0.1% saponin, and mounted on slides using VectaShield mounting medium with DAPI. Alternatively, cells were fixed with cold methanol at −20°C for 4 min and washed extensively with PBS before labeling them with Abs. Confocal images were taken using either Olympus Fluoview 500 microscope with Fluoview version 5.0 software or Zeiss LSM 510 Meta (upright stage) with Zeiss LSM Image Browser version 4.0.0.091 software. The conventional fluorescent images were taken using Olympus BX-60 digital microscope with ImagePro Plus software. VAMP-8 proteins were previously shown to be preferentially enriched in the early endosomes (13), and late endosomes (15). 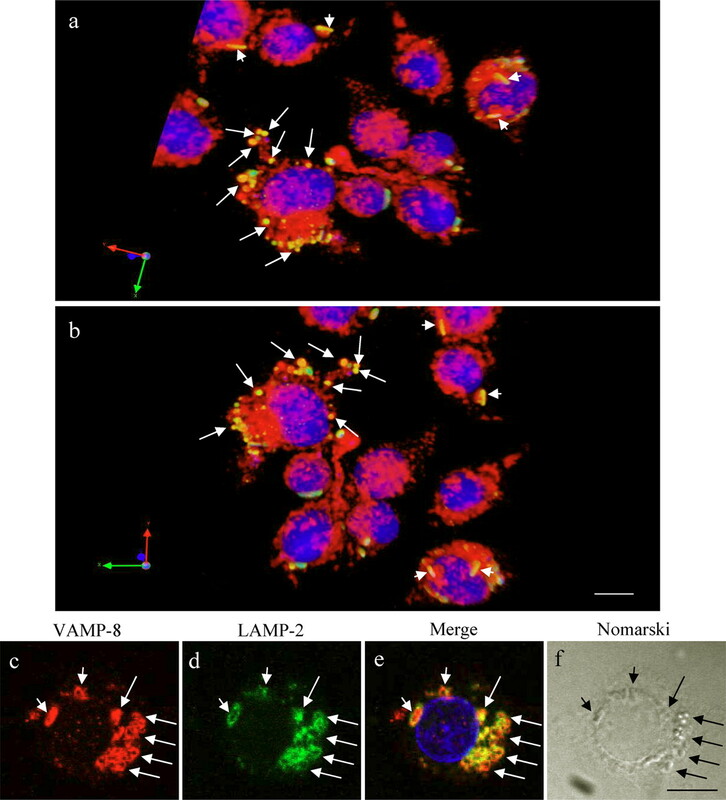 To determine whether VAMP-8 colocalizes with LAMP-2, a late endosomes/lysosomes protein marker in DC, confocal immunofluorescent microscopy was performed using specific Abs against VAMP-8 and LAMP-2. VAMP-8 and LAMP-2 colocalized well in both the DC line, DC2.4 (Fig. 1⇓, a and b) and bone marrow-derived DC (Fig. 1⇓, e–g), indicating that the majority of VAMP-8 was localized to the late endosomal compartments in DC. In contrast, VAMP-3, an early/recycling endosomes localized v-SNARE, (3) did not colocalize with LAMP-2 in DC2.4 line (Fig. 1⇓, c and d). It is worth noting that not all VAMP-8-positive endosomes colocalized with LAMP-2, indicating that at least a smaller pool of VAMP-8 was also localized to the early endosomes in DC. Majority of VAMP-8 is localized to the late endosomal compartments in DC. DC2.4 cells (a and b for VAMP-8, f and g for VAMP-3) were fixed and costained with Abs against VAMP-8 (polyclonal) or VAMP-3 (polyclonal) and LAMP-2 (monoclonal), followed by FITC-conjugated anti-rat IgG and Cy3-conjugated anti-rabbit IgG. Bone marrow-derived primary DC from C57BL/6 mice (c–e) were similarly stained for VAMP-8 and LAMP-2. Images were taken using Olympus Fluoview 500 (a and b, f and g) or Zeiss LSM 510 Meta (c–e). a, Z-scaling = 0.39 μm, Z-stack size = 13.6 μm (n = 35 slices). b, Z-scaling = 0.39 μm, Z-stack size = 15.2 μm (n = 39 slices). f and g, Z-scaling = 0.39 μm, Z-stack size = 16.0 μm (n = 41 slices). Stereo three-dimensional rendering and X-Z/Y-Z projection were performed using the volocity visualization software from Improvision. Scale bar represents 10 μm. 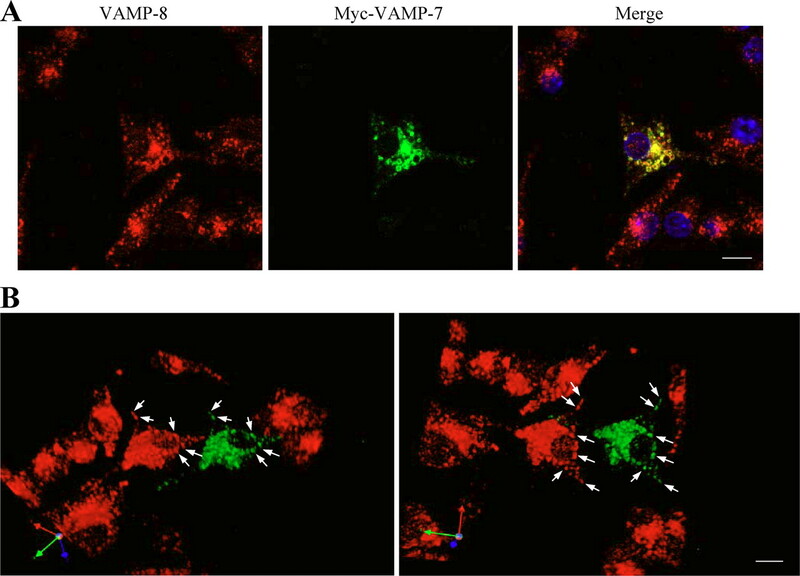 Unlike VAMP-3 (3) and VAMP-7 (7), VAMP-8 has not been shown to be recruited to phagosomes. Because VAMP-8 was localized to both the early and late endosomes in DC, it is interesting to determine whether VAMP-8 was also recruited to the phagosomes during phagocytosis. DC were preincubated with GFP-E. coli for 30 min on ice (0°C), washed, and allowed to internalize the GFP-E. coli at 37°C for various time points. As shown in Fig. 2⇓A, VAMP-8 was recruited to the phagosomes as early as 10 min (Fig. 2⇓A, a–c), and partially recycled off at the 2-h time point (Fig. 2⇓A, m–o) as the early phagosomes underwent progressive maturation to become late phagosomes/phagolysosomes. However, only a small amount of VAMP-3 could be detected on the phagosomes even at the 1-h time point, suggesting that VAMP-3 preferentially recruited to the early phagosomes and VAMP-8 recruited to both the early and late phagosomes (Fig. 2⇓B). Braun et al. (7) reported previously that VAMP-8 was not recruited to phagosomes during phagocytosis of IgG-opsonized sheep RBC in RAW 264.7 cells. To address this discrepancy, we allowed RAW 264.7 cells to internalize GFP-E. coli for 1 h, then cells were fixed and stained for VAMP-8 proteins. Like in DC, VAMP-8 was found to accumulate around the internalized GFP-E. coli (Fig. 2⇓C), suggesting that phagosomal recruitment of VAMP-8 occurs during Fc receptor-independent phagocytosis. 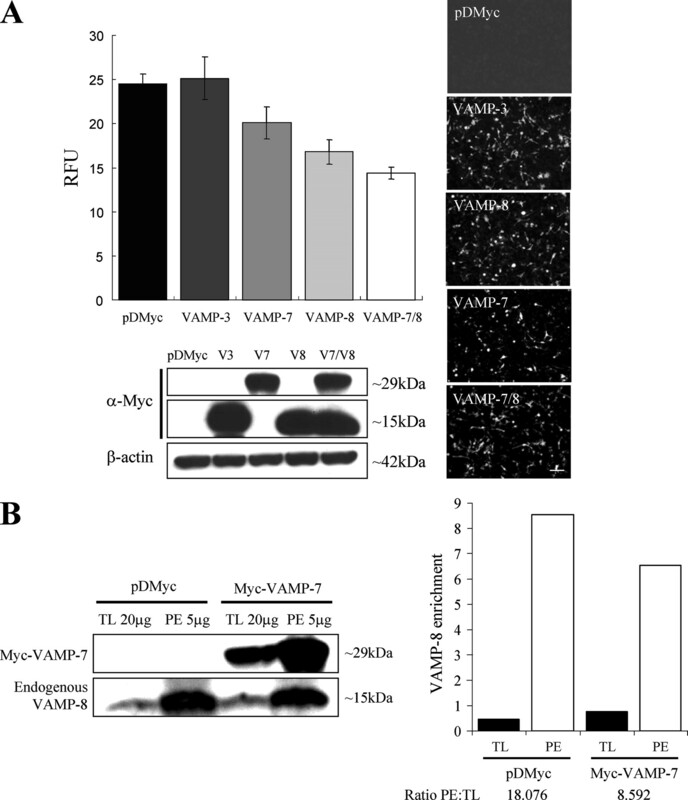 VAMP-8 is recruited to both the early and late phagosomes, whereas VAMP-3 preferentially recruited to the early phagosomes upon phagocytosis of GFP-E. coli. A, Kinetic assay showing the recruitment of VAMP-8 to the phagosomes. Adherence of GFP-bacteria to cell surface was performed at 0°C (on ice) for 30 min. The time points tested were 5, 10, 15, 20, and 30 min and 1, 2, 3, and 4 h. Only selected time points were presented. Arrows point to selected VAMP-8-positive phagosomes. B, The cells were similarly stained for VAMP-3. Arrows indicate VAMP-3-positive phagosomes. C, RAW 264.7 cells were allowed to internalize GFP-E. coli for 1 h, fixed, and stained for VAMP-8. Arrows point to selected VAMP-8-positive phagosomes. Scale bar represents 10 μm. To further confirm that VAMP-8 was recruited to the late phagosomes, we preincubated DC2.4 cells with GFP-E. coli for 20 min at 37°C (to enhance binding of GFP-E. coli to cells), then washed extensively to remove unbound bacteria. Taking that as the zero time point, the cells were allowed to internalize the GFP-E. coli for various time points. By using stereo three-dimensional rendering and X-Z/Y-Z projections of the collected stack confocal images, we further confirmed that a substantial amount of VAMP-8 was recruited to the phagosomes in DC (Fig. 3⇓, open arrows and arrowheads). At 5 h postingestion of bacteria, most of the VAMP-8/GFP-E.coli-positive structures (presumably phagolysosomes) were smaller and rounder in shape as compared with those at the earlier time points (Fig. 4⇓, a and b, long and short arrows). This finding could be due to degradation of GFP-E. coli in the phagolysosomes and the recycling of VAMP-8 to the early and late endosomes (at steady states). By incubating DC with unlabeled E. coli, we observed similar VAMP-8-positive structures that were also stained positive for LAMP-2 at 5 h postingestion, further suggesting that VAMP-8 was indeed associated with the late phagosomes/phagolysosomes (Fig. 4⇓, c–f). To further confirm phagosomal recruitment of VAMP-8, GFP-E. coli-loaded phagosomes were purified from DC by sucrose gradient, lysed, and analyzed by Western blotting using Abs specific for VAMP-3 (positive control), VAMP-8, and Syn-16 (negative control). As expected, both VAMP-3 and VAMP-8, but not Syn-16 (a Golgi SNARE), were enriched in the phagosomal fraction (Fig. 5⇓A). Immunofluorescent staining of the isolated phagosomes also revealed VAMP-3- and VAMP-8-positive GFP-E. coli-phagosomes (Fig. 5⇓B). VAMP-8 colocalizes with ingested GFP-E. coli. A, Stereo three-dimensional rendering of collected confocal images showing the recruitment of VAMP-8 (red) to the GFP-E. coli-containing phagosomes (green) at 0- (20 min at 37°C) and 1-h time points. Arrows indicate colocalization between VAMP-8 and GFP-E. coli/phagosomes. Scale bar represents 5 μm. B, X-Z/Y-Z projection of collected confocal images at 0-h time point showing the colocalization of VAMP-8 and GFP-E. coli at two different positions. Arrows indicate VAMP-8/GFP-E. coli-positive phagosomes, and arrowheads indicate possible extracellular GFP-E. coli bound to the surface of DC. Z-scaling = 0.43 μm, Z-stack size = 19.34 μm (n = 46 slices). C, X-Z/Y-Z projection of collected confocal images at 1-h time point showing more intracellular VAMP-8/GFP-E. coli-positive phagosomes, as indicated (arrows). Z-scaling = 0.43 μm, Z-stack size = 14.18 μm (n = 34 slices). Stereo three-dimensional rendering and X-Z/Y-Z projection were performed using the volocity visualization software from Improvision. VAMP-8 associates with phagolysosomes in DC. DC2.4 cells were preincubated with GFP-E. coli at 37°C for 20 min, after which they were washed to remove extracellular unbound GFP-E. coli. Taking 37°C/20 min as the zero time point, the cells were allowed to internalize the GFP-E. coli (green) for 5 h (a and b). Cells were fixed, labeled for VAMP-8 (red), and viewed under a confocal microscope. Small and round VAMP-8/GFP-E. coli-positive phagosomes (yellow) were indicated with long arrows. Normal rod-shaped VAMP-8/GFP-E. coli phagosomes (yellow) were indicated with short arrows. By incubating DC with unlabeled E. coli, similar VAMP-8-positive structures that are also stained positively for LAMP-2 at 5 h postingestion were observed, further suggesting that VAMP-8 was indeed associated with the late-phagosomes/phagolysosomes (c–f). Three-dimensional rendering was performed using the velocity visualization software from improvision. Z-scaling = 0.43 μm, Z-stack size = 19.77 μm (n = 47 scales). Scale bar represents 10 μm. SNARE enrichment in the phagosomal extract. A, Cells were allowed to internalize GFP-E. coli for 1 h and the phagosomes were extracted as described in Materials and Methods. The isolated phagosomes were processed for Western blot analysis and probed for VAMP-3, VAMP-8, and Syn-16. Immunoblot showed enrichment for both VAMP-3 and VAMP-8, but not for Syn-16, in the phagosomal extract (PE) as compared with the total lysate (TL). Band intensity was quantified using ImageJ software, then normalized to the same amount of protein and data presented on the right. B, The isolated phagosomes were also fixed with 4% paraformaldehyde and stained for VAMP-3, VAMP-8, and Syn-16. Arrows point to selected VAMP-3- or VAMP-8-positive phagosomes. Syn-16 (Golgi apparatus) staining in DC2.4 cells is shown (inset), although it was not detected in the isolated phagosomes. The Cy3 images were taken using the same gain (500 ms). Scale bar represents 10 μm. Because a significant amount of VAMP-8 was recruited to the phagosomes, it is therefore interesting to determine whether VAMP-8 is required for phagocytosis in DC. DC phagocytic activity was measured using the Vybrant Phagocytosis Assay kit purchased from Molecular Probes. After normalizing the cell concentration, VAMP-8−/− and VAMP-8+/+ (wild type) bone marrow-derived DC were seeded into 96-well ELISA plates (Costar) and incubated with fluorescence-conjugated E. coli bioparticles for 2 h. The unbound bioparticles were then removed and extracellular membrane-bound bioparticles were quenched with trypan blue. Fluorescence from engulfed bioparticles was then quantified using an ELISA fluorescence reader. Interestingly, the phagocytic activity of VAMP-8−/− was 48% higher as compared with that of VAMP-8+/+ (Fig. 6⇓A). The corresponding Western blot showed the presence of a 15-kDa band in VAMP-8+/+ DC. No band was detected in VAMP-8−/− DC. Similarly, DC2.4 cells transfected with siRNA specific for VAMP-8 also exhibited enhanced phagocytic activity (Fig. 6⇓B, a). In contrast, transfection with siRNA-specific VAMP-3 has no significant effect on phagocytosis. The corresponding Western blot confirmed the silencing of VAMP-8 and VAMP-3. When the cells were allowed to internalize GFP-E. coli for 1 h, it could even be visually seen that VAMP-8 knock down cells exhibited enhanced phagocytosis (Fig. 6⇓B, b). To determine whether maturation of phagosome is affected in VAMP-8 knock down cells, DC were allowed to internalize GFP-E. coli for 1 h. Silencing of VAMP-8 resulted in accelerated phagosome maturation as depicted from the round bacterial structures (phagolysosomes) present in VAMP-8 knock down cells but not in the control cells (Fig. 6⇓C). As expected DC2.4 cells transiently expressing Myc-VAMP-8 showed a marked decrease in phagocytic activity as compared with control (Fig. 6⇓D). The corresponding western blot showed the presence of an ∼19-kDa band (Myc-VAMP-8) in cells transfected with VAMP-8. Consistent with previous findings that VAMP-3 was not required for phagocytosis (5, 6), our results showed that VAMP-3 did not cause a significant change in phagocytosis. The corresponding Western blot showed the expression level of both Myc-VAMP-3 and Myc-VAMP-8. Furthermore, phagocytosis assay performed on Myc-VAMP-8 stable clones also showed a drastic drop in phagocytic activity (data not shown). VAMP-8 negatively regulates phagocytosis in DC. A, Phagocytic activity was up-regulated in VAMP-8 knockout primary DC. Its corresponding immunoblot showed the absence of VAMP-8 in the knockout cells. B, DC2.4 cells were transfected using Lipofectamine 2000 with either scramble siRNA or siRNA directed toward VAMP-8. The knockdown of VAMP-8 resulted in enhanced phagocytosis (a). Asterisk indicates nonspecific band. Scale bar represents 50 μm. Similarly, transfected cells were allowed to internalize GFP-E. coli for 1 h, washed extensively to remove extracellular GFP-E. coli, then fixed and viewed under microscope at ×10 magnification (b). Enhanced phagocytosis was observed in VAMP-8 knock down cells even at visual level. Scale bar represents 100 μm. C, DC2.4 cells were transfected using Lipofectamine 2000 with either scramble siRNA or siRNA directed toward VAMP-8. VAMP-8 was efficiently silenced in almost all the cells (a). Scale bar represents 50 μm. The same batch of cells was allowed to internalize GFP-E. coli for 1 h. Silencing of VAMP-8 resulted in accelerated phagosome maturation (b). Arrows indicate round bacterial structures that were most likely phagolysosomes. Bar, 10 μm. D, DC2.4 cells triple-transfected with pDMyc, VAMP-3, and VAMP-8 were compared. Phagocytic activity in VAMP-3-transfected DC2.4 cells did not show significant difference with those transfected with pDMyc. Comparatively, phagocytosis was down-regulated by ∼38% in VAMP-8-transfected DC2.4 cells. Immunofluoresent images and immunoblot confirmed successful overexpression of the proteins. Transfection was performed using Qiagen Effectene Transfection kit. Images were taken using Olympus BX-60 digital microscope at ×10 magnification. Scale bar represents 100 μm. E, The number of bioparticles ingested was manually counted under 100X immersion oil objective; n = 24 view areas randomly selected for counting; n = 95 VAMP-8-transfected cells counted; and n = 323 untransfected cells counted. The average number of bioparticles engulfed per cell was then computed and presented in terms of a percentage. The number of bioparticles engulfed by VAMP-8-transfected cells was reduced by >4-fold as compared with those by nontransfected cells. Experiment was repeated three times and similar trend was observed. Fluorescent reading was quantitated using SpectraMax Gemini EM ELISA plate reader (A and C) or Tecan GENios ELISA plate reader (B). To further confirm the phagocytic inhibition effect by VAMP-8 overexpression in DC, DC2.4 cells were transiently transfected with Myc-VAMP-8 and incubated with the E. coli bioparticles for 2 h. Extracellular membrane-bound bioparticles were quenched with trypan blue for 2 min and washed with PBS. Cells were then fixed with methanol and then labeled with anti-c-myc Ab (for detecting Myc-VAMP-8) and secondary rhodamine-conjugated goat anti-mouse IgG. Under 100X oil immersion objective, the number of bioparticles in pDMyc-VAMP-8 and vector transfected cells were quantified. A total of 24 view areas were randomly selected for counting. The amount of bioparticles engulfed (or ingested) by Myc-VAMP-8 transfected cells was drastically reduced as compared with control (Fig. 6⇑E). Taken together, our results strongly suggest that VAMP-8 negatively regulates phagocytosis of bacteria in DC. Both VAMP-8 and VAMP-7 had been shown to interact with the Syn-7/Syn-8/Vti1b complex in the endosomes (18) and were reported to be essential for the membrane fusion events in the endosomes most probably via their ability to form complexes with Syn-7/Syn-8/Vti1b (18). There is a possibility that the phagocytosis inhibitory effects of VAMP-8 on phagocytosis in DC could be due to its ability to form complexes with Syn-7/Syn-8/Vti1b. VAMP-8/Syn-7/Syn-8/Vti1b complex formation might enhance membrane homotypic fusion events in the endosomes and indirectly affects the phagocytic process. If this is the case, it is interesting to determine whether overexpression of VAMP-7 (which can also form complexes with Syn-7/Syn-8/Vti1b and had been shown to be able to enhance membrane heterotypic fusion events in the endosomes) in DC can inhibit phagocytosis. To gain insight into this possibility, Myc-tagged VAMP-7 (Myc-VAMP-7) was overexpressed in DC. 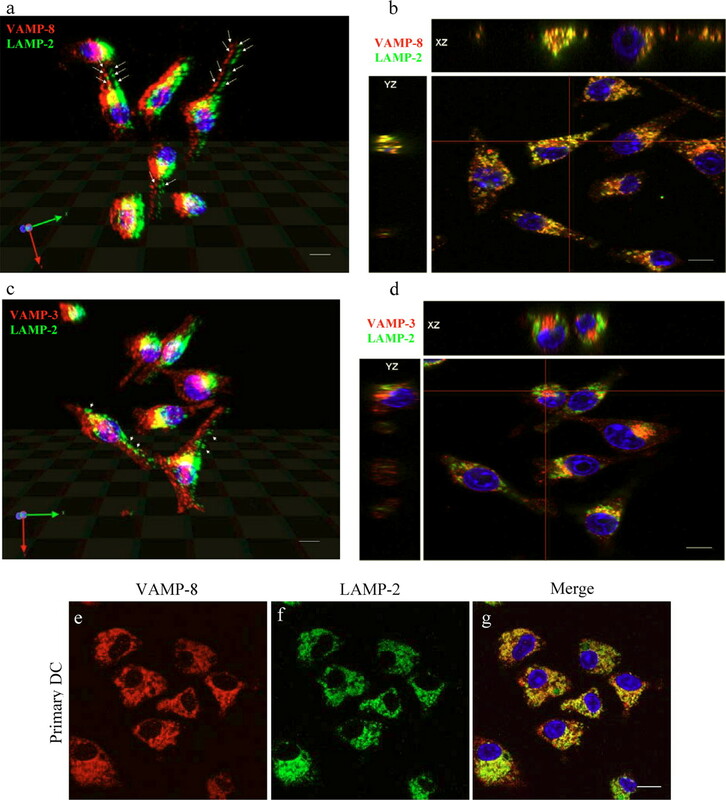 Confocal immunofluorescent microscopy showed that Myc-VAMP-7 colocalized well with VAMP-8 in the endosomal membranes of DC (Fig. 7⇓). As anticipated, like in the case of VAMP-8 overexpression, overexpression of Myc-VAMP-7 but not Myc-VAMP-3 (as control) inhibited phagocytosis in DC (Fig. 8⇓A). In addition, overexpression of both Myc-VAMP-7 and Myc-VAMP-8 further inhibited the phagocytic activity (Fig. 8⇓A). Interestingly, we also observed that overexpression of Myc-VAMP-7 significantly reduced recruitment of endogenous VAMP-8 to phagosomes (Fig. 8⇓B), thus suggesting that VAMP-7 competed efficiently with VAMP-8 recruiting to phagosomes. VAMP-7 and VAMP-8 colocalize in the endosomes. A, DC2.4 cells were transfected with pDMyc-VAMP-7, fixed, labeled with anti-c-myc (to detect Myc-VAMP-7) and anti-VAMP-8 Abs, and viewed and analyzed using a confocal imaging system. VAMP-8 (red) colocalizes with VAMP-7 (green) in the endosomes. VAMP-7/VAMP-8-positive endosomes were labeled yellow. B, Stereo three-dimensional rendering images of VAMP-8 and Myc-VAMP-7 subcellular localization in DC. Colocalization of VAMP-8 (red) with Myc-VAMP-7-positive endosomes (green) viewed at two different angles. VAMP-8/Myc-VAMP-7-positive endosomes were indicated with arrows. Z-scaling = 0.49 μm, Z-stack size = 12.26 μm (n = 26 slices). Transfection was performed using Lipofectamine 2000. Scale bar represents 10 μm. VAMP-7 inhibits phagocytosis in DC. A, DC2.4 cells were transfected using Lipofectamine 2000. After 24 h, the cells were assayed for their phagocytic activities. Overexpression of VAMP-3 had no effect on phagocytosis, whereas overexpression of VAMP-7 and VAMP-8 down-regulated it. Phagocytic activity of cells cotransfected with VAMP-7 and VAMP-8 was further down-regulated. Corresponding immunoblots and immunofluorescent images indicate protein expression and transfection efficiency. Scale bar represents 100 μm. B, DC2.4 cells were transfected with pDMyc vector or pDMyc-VAMP-7. At 24 h posttransfection, the cells were allowed to internalize GFP-E. coli. Isolated phagosomes were processed for western blotting and probed for Myc-VAMP-7 and endogenous VAMP-8. The band intensity was quantified using ImageJ software, normalized to the same amount of protein, and represented as shown. The ratio of phagosomal extract to total lysate (PE:TL) was computed. Based on previous reports (the link between VAMP-3 and VAMP-7 and phagocytosis), and our observation that VAMP-8 is localized to the phagosomes, we speculated that VAMP-8 plays a role in phagocytosis. However, interestingly we observed an increase in the phagocytic activity of VAMP-8−/− as compared with VAMP-8+/+ (wild type) DC. Consistent with this finding, we also found that overexpression of VAMP-8 reduced phagocytic activity. Our study suggests that VAMP-8 inhibits phagocytosis in DC. However, the inhibition of phagocytosis by VAMP-8 is not due to a reduction of cell surface scavenger receptors (data not shown). The formation of phagosomes requires targeted delivery of vesicles from the recycling endosomal compartment, contributing to the elongation of membranous pseudopods (3). Once internalized, the phagosomal membrane undergoes progressive maturation and recruits membrane proteins found in the early endosomes, the late endosomes and the lysosomes (22). Multiple members of the VAMP and syntaxin families have been identified and localized to specific membrane compartments along the secretory and endocytic pathways. In vitro studies have shown that phagosome-endosome and phagosome-lysosome fusions are NSF-dependent, thus indicating a requirement for SNARE proteins in the phagocytosis process (23, 24). Furthermore, phagosomes isolated at various time points have different fusion capability, suggesting that temporal changes in its membrane protein composition influence its fusion capacity. Thus, recruitment of multiple SNARE proteins to the phagosomes over time is essential in regulating fusion events during phagocytosis. Membrane trafficking and fusion involves not only interaction between cognate SNARE proteins on opposing membranes; tethering factors interact with SNARE proteins and facilitate SNARE complex assembly. Tethering factors typically form highly extended coiled-coil structures and enhance the efficiency of membrane trafficking by linking the opposing membranes (25). In addition, it is generally known that the switching of NSF between its ATP and ADP bound forms, via ATP hydrolysis, is required for SNARE complex disassembly. SNAREs are initially functionally classified as vesicle-associated (v-SNAREs) and target compartment-associated (t-SNAREs) based on their vesicle or target membrane localization (26). SNAREs were later reclassified structurally as R-SNARE and Q-SNARE based on a highly conserved arginine and glutamine residue, respectively (27). Q-SNAREs are further divided based on the amino acid sequence homology of the SNARE domains. The syntaxin subfamily is also known as the Qa subfamily. SNAREs that are more homologous to the N-terminal of SNAP-25 are assigned the name S25N, otherwise known as Qb subfamily. Similarly, SNAREs that are more homologous to the C-terminal of SNAP-25 are assigned the name S25C, or Qc. It is believed that a SNARE complex is made up of one protein from each subfamily, that is, Qa:Qb:Qc:R.
VAMP-8, one of the SNARE types localized to the endosomes, had been shown to play important roles, from homotypic fusion of early and late endosomes (15, 18), exocytosis of vesicles (14, 19, 28, 29), cytokinesis (30), to its role in phagocytosis modulation (our current findings). VAMP-8 forms complexes with Syn-7, Syn-8, and Vti1b, which mediates homotypic fusion of early and late endosomes (15, 17, 18). VAMP-8 also forms complexes with Syn-4 and SNAP-23, which is involved in granule secretion of mast cells (28), granule secretion of platelets (29), and exocytosis of pancreatic acinar cells (19). Overexpression of VAMP-8 in MIN6 cells significantly increased GABA release (14), and although the precise complex involved was not defined, it is likely to involve the complex required for exocytosis. VAMP-8 has also been shown to be important in the terminal step of cytokinesis in the mammalian cells (30), where it was localized to the mid-body of late telophase NRK cells and that introduction of VAMP-8 lacking the C-terminal transmembrane region into MDCK cells resulted in the formation of binucleated cells. Although localized to the endosomes, recruitment of VAMP-8 to the phagosomes had not been reported before this. In this study, we reported that VAMP-8 was recruited to early and late phagosomes and it negatively regulates phagocytosis in DC. We showed that VAMP-8 proteins, presumably from the early endosomes were recruited to a small number of early phagosomes formed after 10 min incubation at 37°C (preincubation with GFP-E. coli at 0°C). At later incubation time points at 37°C, a higher number of VAMP-8-positive phagosomes were observed, indicating that VAMP-8 was preferentially recruited to the late phagosomes. Recruitment of VAMP-8 to the late phagosomes was consistent with the fact that the majority of VAMP-8, which localized to the late endosomal compartments, colocalized with LAMP-2 in DC (in this study). Because VAMP-8 was recruited to the early and late phagosomes, it is therefore essential to determine whether VAMP-8 played important roles in the phagocytosis process. Interestingly, our results showed that VAMP-8 negatively regulates phagocytosis in DC. There is a possibility that VAMP-8 competes with another R-SNARE protein essential for phagosomes formation such as VAMP-3 and VAMP-7. This hypothesis is supported by the early recruitment of VAMP-8 to the phagosomes in DC (Fig. 3⇑). Although VAMP-3 had been shown to be recruited to the phagosomes in macrophages, phagocytosis process in VAMP-3 knockout cells was not affected (5, 6). Consistently, we showed that silencing of VAMP-3 using siRNA specific for VAMP-3 and overexpression of VAMP-3 did not affect phagocytosis in DC (Figs. 5⇑B and 6⇑B). VAMP-8 has been reported to form complex with Syn-7, Syn-8, and Vti1b, which mediates homotypic fusion of early and late endosomes (15, 17, 18). As reported previously, Syn-7 was recruited to phagosomes in macrophages (31). Interestingly, this same set of Syn-7-containing Q-SNAREs (Syn-7-Syn-8-Vti1b) also partners with VAMP-7 for mediating heterotypic fusion of the late endosomes and lysosomes (18). VAMP-7 had been shown to play important roles in optimal phagocytosis of opsonized particles in macrophages (7). However, we observed that overexpression of VAMP-7 inhibited phagocytosis in DC in this study. Because both VAMP-8 and VAMP-7 had been reported to interact with a common SNARE partner (Syn-7-Syn-8-Vti1b complex), and VAMP-7 and VAMP-8 colocalized on the endosomal membranes in DC (in this study), it is possible that VAMP-7 could compete with VAMP-8 (or vice versa) during recruitment to the phagosomal membranes. As expected, we observed that overexpression of Myc-VAMP-7 reduced the recruitment of endogenous VAMP-8 to the phagosomal membranes, suggesting that there were significant competitive interactions of VAMP-8 and VAMP-7 with Q-SNAREs on phagosomes. However, because coexpression of both Myc-VAMP-7 and Myc-VAMP-8 in DC can further inhibit phagocytosis, there is also a possibility that VAMP-7 and VAMP-8 might form partners with different sets of Q-SNAREs on the phagosomal membranes. In this context, VAMP-7 and VAMP-8 might compete with another unknown but essential SNARE-like protein(s) for the same set(s) of Q-SNAREs. Further study along this line will lead us to identify various Q-SNARE complexes that form partners with VAMP-7 and VAMP-8 on the phagosomal membranes and confirm the functional relationship between VAMP-7 and VAMP-8 in the regulations of phagosome formation and phagocytosis in DC. During the preparation of this report, Zhou and colleagues (32) reported that bacteria-generated phosphatidylinositol 3-monophosphate recruits VAMP-8 and facilitates Salmonella-induced invasion of HeLa cells. Salmonella had been reported to invade nonphagocytic cells by macropinocytosis and SopB is involved in regulating actin dynamics to promote Salmonella-induced invasion (33). Because HeLa cells are nonphagocytic cells, the route of bacteria uptake by HeLa cells in their study could most likely be via macropinocytosis instead of the phagocytic pathway. However, in phagocytic cells such as macrophages and DC (this study), the uptake of bacteria is most likely via the phagocytic pathway. In this context, VAMP-8 containing SNARE complexes might play distinct roles when recruited to phagosomes and macropinosomes, respectively. Because VAMP-8 had been reported to be essential for exocytosis, during invasion of HeLa cells by Salmonella, VAMP-8 is expected to play a role in the trafficking of receptors important for Salmonella invasion to the cell surface. 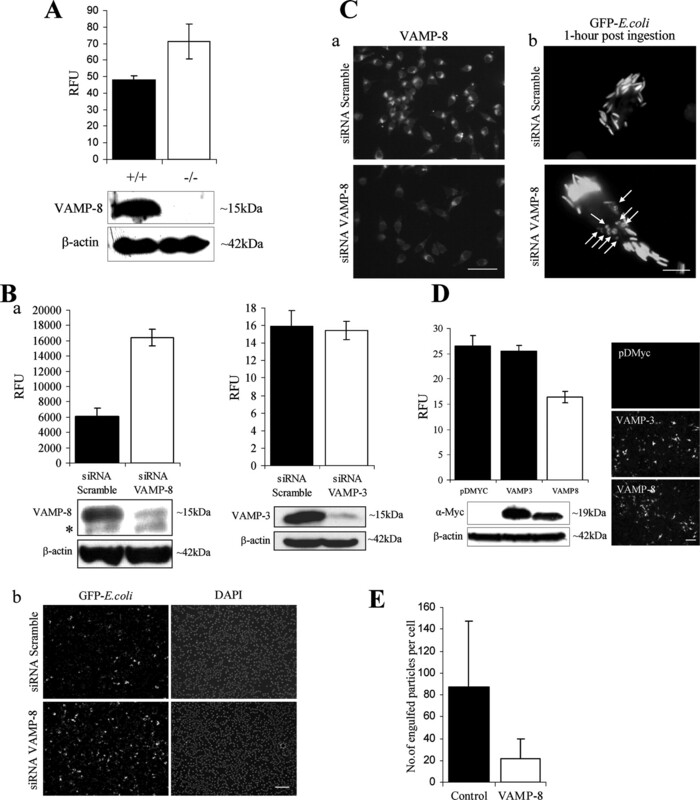 Down-regulation of VAMP-8 by VAMP-8-specific siRNA reduces this receptor and thus inhibits Samonella invasion via macropinocytosis. However, VAMP-8-containing complex had been demonstrated to mediate homotypic fusion of the early endosomes as well (17, 18). In phagocytic cells such as DC and macrophages, down-regulation of VAMP-8 not only reduces homotypic fusion near the cell surface but also exocytosis. However, a decrease in VAMP-8 expression could have a positive effect on phagocytosis, possibly due to an increase in opportunity for other SNARE molecules to bind to a common sets of SNARE-containing complexes that might enhance phagosomes maturation and phagocytosis. Thus, functional interactions between endosomal SNAREs create a “balancing act” in the regulation of phagocytosis in phagocytic cells. We thank Dr. Kevin Tan Shyong-wei (Department of Microbiology, National University of Singapore, Singapore) for the generous gift of GFP-E. coli, Dr. Gan Yunn-Hwen (Department of Biochemistry, National University of Singapore, Singapore) for the RAW 264.7 cell line, Dr. Kenneth Rock for the DC2.4 cell line, and Prof. Wanjin Hong (Institute of Molecular and Cell Biology, Singapore) and members of the Membrane Trafficking and Immunoregulation Research Laboratory for critical reading of the manuscript. ↵1 This work was supported by Grant R182-005-067-731 from the Microbiology Vaccine Initiative (to S.H.W.) and by the Academic Research Council, Singapore Ministry of Education (R182-000-099-112 to S.H.W.). ↵3 Abbreviations used in this paper: DC, dendritic cell; VAMP, vesicle-associated membrane protein; LAMP, lysosome-associated membrane protein; ER, endoplasmic reticulum; NSF, N-ethylmaleimide-sensitive factor; siRNA, small interfering RNA. Garrett, W. S., L. Chen, R. Kroschewski, M. Ebersold, S. Turley, S. Trombetta, J. E. Galan, I. Mellman. 2000. Developmental control of endocytosis in dendritic cells by Cdc42. Cell 102: 325-334. Booth, J. W., W. S. Trimble, S. Grinstein. 2001. Membrane dynamics in phagocytosis. Semin. Immunol. 13: 357-364. Bajno, L., X. Peng, A. D. Schreiber, H. Moore, W. S. Trimble, S. Grinstein. 2000. Focal exocytosis of VAMP3-containing vesicles at sites of phagosome formation. J. Cell Biol. 149: 697-705. Hackam, D. J., O. D. Rotstein, C. Sjolin, A. D. Schreiber, W. S. Trimble, S. Grinstein. 1998. v-SNARE-dependent secretion is required for phagocytosis. Proc. Natl. Acad. Sci. USA 95: 11691-11696. Yang, C., S. Mora, J. W. Ryder, K. J. Coker, P. Hansen, L. A. Allen, J. E. Pessin. 2001. VAMP3 null mice display normal constitutive, insulin and exercise-regulated vesicle trafficking. Mol. Cell Biol. 21: 1573-1580. Allen, L. H., C. Yang, J. E. Pessin. 2002. Rate and extent of phagocytosis in macrophages lacking VAMP3. J. Leukocyte Biol. 72: 217-221. Braun, V., V. Fraisier, G. Raposo, I. Hurbain, J. Sibarita, P. Chavrier, T. Galli, F. Niedergang. 2004. TI-VAMP/VAMP7 is required for optimal phagocytosis of opsonised particles in macrophages. EMBO J. 23: 4166-4176. Gagnon, E., S. Duclos, C. Rondeau, E. Chevet, P. H. Cameron, O. Steele-Mortimer, J. Paiement, J. J. Bergeron, M. Desjardins. 2002. Endoplasmic reticulum-mediated phagocytosis is a mechanism of entry into macrophages. Cell 110: 119-131. Becker, T., A. Volchuk, J. E. Rothman. 2005. Differential use of endoplasmic reticulum membrane for phagocytosis in J774 macrophages. Proc. Natl. Acad. Sci. USA 102: 4022-4026. Hatsuzawa, K., T. Tamura, H. Hashimoto, H. Hashimoto, S. Yokoya, M. Miura, H. Nagaya, I. Wada. 2006. Involvement of syntaxin 18, an endoplasmic reticulum (ER)-localized SNARE protein, in ER-mediated phagocytosis. Mol. Biol. Cell 17: 3964-3977. Touret, N., P. Paroutls, M. Tereblznlk, R. E. Harrison, S. Trombetta, M. Pypaert, A. Chow, A. Jiang, J. Shaw, C. Yip, et al 2005. Quantitative and dynamic assessment of the contribution of the ER to phagosome formation. Cell 123: 157-170. Advani, R. J., H. Bae, J. B. Bock, D. S. Chao, Y. Doung, R. Prekeris, J. Yoo, R. H. Scheller. 1998. Seven novel mammalian SNARE proteins localize to distinct membrane compartments. J. Biol. Chem. 273: 10317-10324. Wong, S. H., T. Zhang, V. N. Subramaniam, G. Griffiths, W. Hong. 1998. Endobrevin, a novel synaptobrevin/VAMP-like protein preferentially associated with the early endosome. Mol. Biol. Cell 9: 1549-1563. Nagamatsu, S., Y. Nakamichi, T. Watanabe, S. Matsushima, S. Yamaguchi, J. Ni, E. Itagaki, H. Ishida. 2000. Localization of cellubrevin-related peptide, endobrevin, in the early endosome in pancreatic β cells and its physiological function in exo-endocytosis of secretory granules. J. Cell Sci. 114: 219-227. Antonin, W., C. Holroyd, R. Tikkanen, S. Höning, R. Jahn. 2000. The R-SNARE endobrevin/VAMP8 mediates homotypic fusion of early endosomes and late endosomes. Mol. Biol. Cell 11: 3289-3298. Bui, T. D., S. H. Wong, L. Lu, W. Hong. 1998. Endobrevin maps to chromosome 2 in human and chromosome 6 in mouse. Genomics 54: 579-580. Antonin, W., C. Holroyd, D. Fasshauer, S. Pabst, G. F. V. Mollard, R. Jahn. 2000. A SNARE complex mediating fusion of late endosomes defines conserved properties of SNARE structure and function. EMBO J. 19: 6453-6464. Pryor, P. R., B. M. Mullock, N. A. Bright, M. R. Lindsay, S. R. Gray, S. C. W. Richardson, A. Stewart, D. E. James, R. C. Piper, J. P. Luzio. 2004. Combinatorial SNARE complexes with VAMP7 and VAMP8 define different late endocytic fusion events. EMBO Rep. 5: 590-595. Wang, C. C., C. P. Ng, L. Lu, V. Atlashkin, W. Zhang, L. Seet, W. Hong. 2004. A role of VAMP8/Endobrevin in regulated exocytosis of pancreatic acinar cells. Dev. Cell 7: 359-371. Wong, S. H., L. Santambrogio, J. L. Strominger. 2004. Caspases and nitric oxide broadly regulate dendritic cell maturation and surface expression of class II MHC proteins. Proc. Natl. Acad. Sci. USA 101: 17783-17788. Santambrogio, L., I. Potolicchio, S. P. Fessler, S. H. Wong, G. Raposo, J. L. Strominger. 2005. Involvement of caspase-cleaved and intact adaptor protein 1 complex in endosomal remodeling in maturing dendritic cells. Nat. Immunol. 6: 1020-1028. Tjelle, T. E., T. Lovdal, T. Berg. 2000. Phagosome dynamics and function. Bioassays 22: 255-263. Mayorga, L. S., F. Bertini, P. D. Stahl. 1991. Fusion of newly formed phagosomes with endosomes in intact cells and in a cell-free system. J. Biol. Chem. 266: 6511-6517. Funato, K., W. Beron, C. Z. Yang, A. Mukhopadhyay, P. D. Stahl. 1997. Reconstitution of phagosome-lysosome fusion in streptolysin o-permeabilised cells. J. Biol. Chem. 272: 16147-16151. Pfeffer, S. R.. 1999. Transport-vesicle targeting:tethers before SNAREs. Nat. Cell Biol. 1: E17-E22. Söllner, T., S. W. Whiteheart, M. Brunner, H. Erdjument-Bromage, S. Geromanos, P. Tempst, J. E. Rothman. 1993. SNAP receptors implicated in vesicle targeting and fusion. Nature 362: 318-324. Fasshauer, D., R. B. Sutton, A. T. Brunger, R. Jahn. 1998. Conserved structural features of the synaptic fusion complex: SNARE proteins reclassified as Q- and R-SNAREs. Proc. Natl. Acad. Sci. USA 95: 15781-15786. Paumet, F., J. L. Mao, S. Martin, T. Galli, B. David, U. Blank, M. Roa. 2000. Soluble NSF attachment protein receptors (SNAREs) in RBL-2H3 mast cells: functional role of syntaxin 4 in Exocytosis and identification of a vesicle-associated membrane protein 8-containing secretory compartment. J. Immunol. 164: 5850-5857. Polgár, J., S. Chung, G. L. Reed. 2002. Vesicle-associated membrane 3 (VAMP-3) and VAMP-8 are present in human platelets and are required for granule secretion. Blood 100: 1081-1083. Low, S. H., X. Li, M. Miura, N. Kudo, B. Quinones, T. Weimbs. 2003. Syntaxin 2 and endobrevin are required for the terminal step of cytokinesis in mammalian cells. Dev. Cell 4: 753-759. Collins, R. F., A. D. Schreiber, S. Grinstein, W. S. Trimble. 2002. Syntaxins 13 and 7 function at distinct steps during phagocytosis. J. Immunol. 169: 3250-3256. Dai, S., Y. Zhang, T. Weimbs, M. B. Yaffe, D. Zhou. 2007. Bacteria-generated PtdIns3P recruits VAMP-8 to facilitate phagocytosis. Traffic 8: 1365-1374. Zhou, D., L. Chen, L. Hernandez, S. B. Shears, J. E. Galan. 2001. 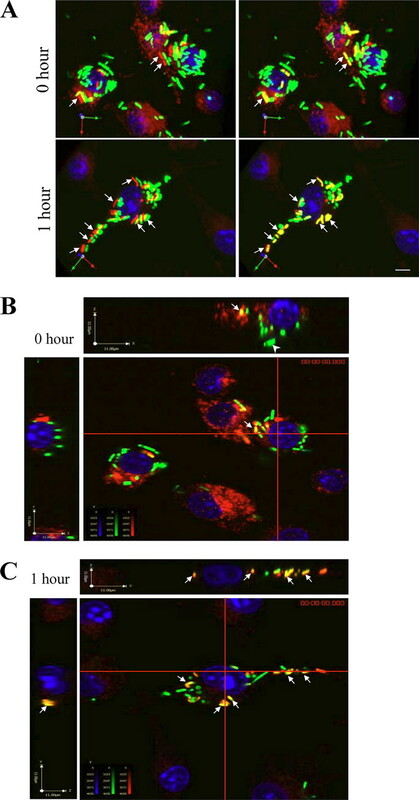 A Salmonella inositol polyphosphatase acts in conjunction with other bacterial effectors to promote host cell actin cytoskeleton rearrangements and bacterial internalization. Mol. Microbiol. 39: 248-259.